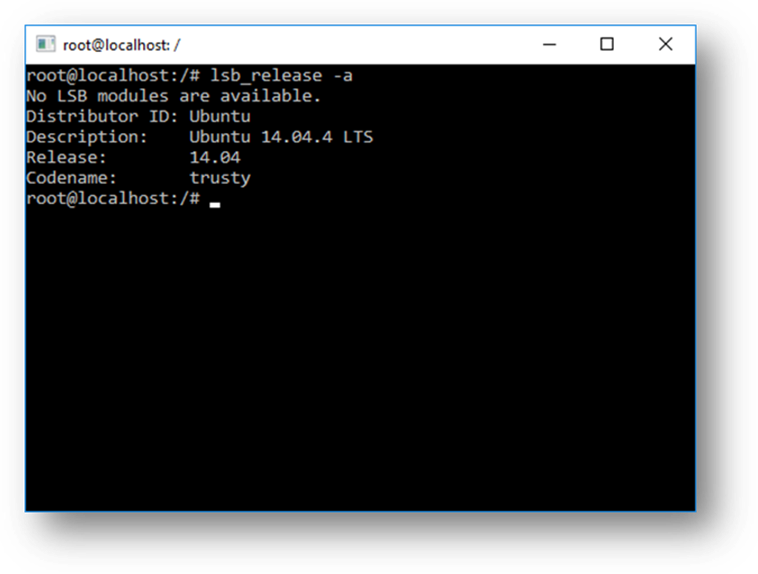 What is Windows Subsystem for Linux (WSL)? See the about page for more details. This is primarily a tool for developers -- especially web developers and those who work on or with open source projects. This allows those who want/need to use Bash, common Linux tools (sed, awk, etc.) and many Linux-first tools (Ruby, Python, etc.) to use their toolchain on Windows. What can I do with WSL? Bash is a popular text-based shell and command-language. It is the default shell included within Ubuntu and other Linux distros, and in macOS. Users type commands into a shell to execute scripts and/or run commands and tools to accomplish many tasks. Check out our blog where we go into detail about the underlying technology. Why would I use WSL rather than Linux in a VM? WSL requires fewer resources (CPU, memory, and storage) than a full virtual machine. WSL also allows you to run Linux command-line tools and apps alongside your Windows command-line, desktop and store apps, and to access your Windows files from within Linux. This enables you to use Windows apps and Linux command-line tools on the same set of files if you wish. Why would I use, for example, Ruby on Linux instead of on Windows? Some cross-platform tools were built assuming that the environment in which they run behaves like Linux. For example, some tools assume that they are able to access very long file paths or that specific files/folders exist. This often causes problems on Windows which often behaves differently from Linux. Many languages like Ruby and node are often ported to, and run great, on Windows. However, not all of the Ruby Gem or node/NPM library owners port their libraries to support Windows, and many have Linux-specific dependencies. This can often result in systems built using such tools and libraries suffering from build and sometimes runtime errors or unwanted behaviors on Windows. These are just some of issues that caused many people to ask Microsoft to improve Windows’ command-line tools and what drove us to partner with Canonical to enable native Bash and Linux command-line tools to run on Windows. What does this mean for PowerShell? While working with OSS projects, there are numerous scenarios where it’s immensely useful to drop into Bash from a PowerShell prompt. Bash support is complementary and strengthens the value of the command-line on Windows, allowing PowerShell and the PowerShell community to leverage other popular technologies. Can I run ALL Linux apps in WSL? No! WSL is a tool aimed at enabling users who need them to run Bash and core Linux command-line tools on Windows. Also, even though you will be able to run many popular server applications (e.g. Redis), we do not recommend WSL for hosting production services – Microsoft offers a variety of solutions for running production Linux workloads in Azure, Hyper-V, and Docker. What Windows SKUs is WSL included in? Windows Subsystem for Linux is available on the desktop version of Windows for Windows 10 Anniversary and Creators update or later. Beginning in the Fall Creators update WSL will be available on both the desktop and server SKUs of Windows. What processors does WSL support? WSL supports x64 and ARM CPUs. How do I access my C: drive? Mount points for hard drives on the local machine are automatically created and provide easy access to the Windows filesystem. How do I use a Windows file with a Linux app? One of the benefits of WSL is being able to access your files via both Windows and Linux apps or tools. Using your mounted drives, you can edit code in, for example, C:\dev\myproj\ using Visual Studio / or VS Code, and build/test that code in Linux by accessing the same files via \mnt\c\dev\myproj. Are files in the Linux drive different from the mounted Windows drive? Why are there so many errors when I run apt-get upgrade? Some packages use features that we haven't implemented yet. udev, for example, isn't supported yet and causes several apt-get upgrade errors. Write the following to /usr/sbin/policy-rc.d and save your changes. How do I uninstall a WSL Distribution? WSL distributions installed from the store can be uninstalled like any other Windows app, by right-clicking on the app tile and clicking Uninstall, or via PowerShell using the Remove-AppxPackage cmdlet. Why does ping generate permission denied errors? In WSL builds < 14926, ping required WSL to run via an elevated Console. This issue was fixed in Build 14926 and later. How do I run an OpenSSH server? 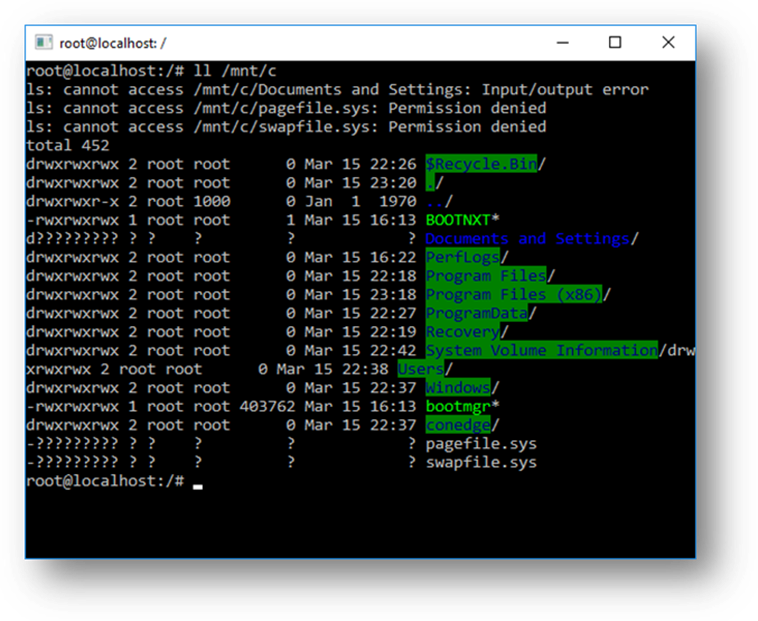 Administrator privileges in Windows are required to run OpenSSH in WSL. To run an OpenSSH server, run Bash on Ubuntu on Windows as an administrator, or run bash.exe from a CMD/PowerShell prompt with administrator privileges. Why do I get "Error: 0x80040306" when I try to install? Right click title bar -> Properties -> Uncheck "Use legacy console"
Why do I get "Error: 0x80040154" when I run bash.exe after upgrading Windows? The "Windows Subsystem for Linux" feature may be disabled during a Windows update. If this happens the Windows feature must be re-enabled. Instructions for enabling the "Windows Subsystem for Linux" feature can be found in the Installation Guide. How do I change the display language of WSL? WSL install will try to automatically change the Ubuntu locale to match the locale of your Windows install. If you do not want this behavior you can run this command to change the Ubuntu locale after install completes. You will have to relaunch bash.exe for this change to take effect. Why do I not have internet access from WSL? In some cases turning off the firewall allows for access. In some cases simply having the firewall installed looks to block access. How do I access a port from WSL in Windows? WSL shares the IP address of Windows, as it is running on Windows. As such you can access any ports on localhost e.g. if you had web content on port 1234 you could https://localhost:1234 into your Windows browser. Via Twitter. Please follow @richturn_ms on Twitter to learn of news, updates, etc.